The smart way to protect your home from the elements. The front of your home is the focal point for guests and visitors, which is why it should be kept looking clean and new. We offer a range of high-quality, long-lasting and durable roofline options to keep your home looking its best, no matter what time of year. 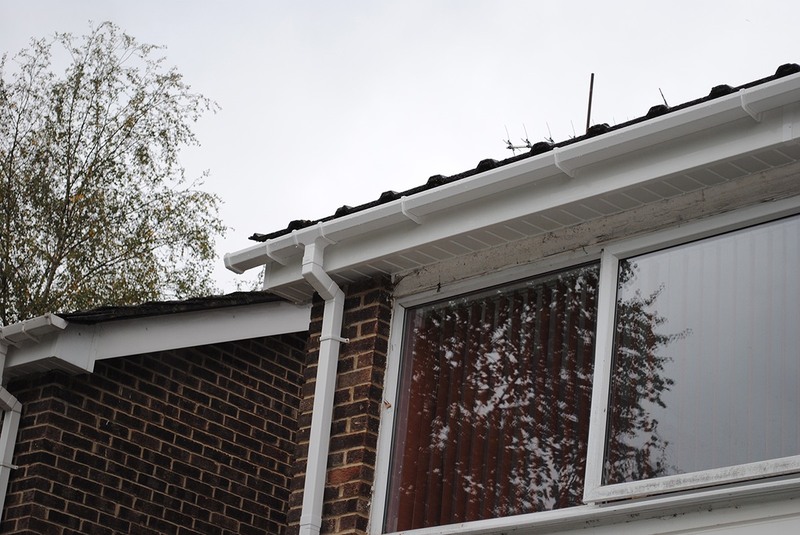 With a variety of soffits, fascias and guttering options available, your home will benefit from improved protection and heightened aesthetics. Each roofline option is made from the best quality material to ensure you are given the best product on the market. You can choose from a range of customisation options to ensure your chosen roofline option matches your home and blends in seamlessly. Available in a range of high-quality colours and finishes, you can be sure that the roofline option you desire will blend in perfectly with your home. Each option you choose is guaranteed not to rot, warp or discolour. Let water ingress be a thing of the past with our exceptional, high-quality range of roofline options. Whether it is guttering, soffits or fascias, our variety is manufactured to fit your home perfectly. Give your home an upgrade and install one of our range of options. We understand that your free time shouldn’t be spent scrubbing your home clean. Each roofline option available is guaranteed to be low maintenance, needing only a quick wipe to ensure your roofline is looking clean and new. Our extensive variety of roofline options are available for your home improvement needs. Made from highly durable, long-lasting materials, your chosen option is guaranteed to last for many years without rotting, warping or discolouring. Installed by our team of highly-skilled experts, each roofline option is manufactured to your exact design specifications, which means it will fit perfectly on to the exterior of your home. Each member of our team is on hand to provide information before, during and after the process. Working with market-leading companies, we can provide you with roofline options that are manufactured to last for many years, without the need to replace them often. Each option is designed to keep harsh weather out, protecting you and your family. Soffits are installed underneath fascias and are what most guests see when visiting your home. This type of roofline option is normally used as ventilation, reducing the risk of timber decay in the roof of your home. Made from strong material, your home’s protection will be heightened, keeping you and your family safe indoors. Keeping your home away from unwanted water ingress, rough winds and stray leaves is even easier with our range of guttering options available for your home improvement. Each one will be manufactured to your exact design specifications, which means your guttering will fit flawlessly. You won’t have to worry about leaks and water damage again. Running alongside the guttering, fascia boards are highly effective in keeping your home looking new and clean. Manufactured to your design specifications, your fascias will fit the length of the guttering perfectly, ensuring your home is protected all year round. Each board is made from highly-durable material, making sure you are given the best product. Give your home an extra layer of insulation by installing cladding on to the front. Whether your home is traditional or modern, cladding is guaranteed to be perfect for any type of home. All the cladding boards we offer are made from the best quality material, that is manufactured to withstand any weather condition, from rough winds to heavy rain. If your home is looking a bit worn out, installing our range of roofline options is just what it needs. Give us a call today to find out more about the variety we offer, we will be happy to guide you through the various options. Our team of highly-trained experts will be on hand to deliver tailored advice, giving you all the information you need before making an informed decision. If you don’t have enough time to call us, you can send us an email and we will be glad to respond. Our members of staff are available each day to answer any questions you have, giving you a quick quote at the end. Use our online form to send us an email today and we will get back to you as soon as possible. In addition to fascias, soffits and guttering, we can provide prices for other products. When calling us for advice and prices, don’t forget to ask about our doors, windows and conservatories, which we can include as part of your roofline quote.